Cyclone Yasi is a category 5 tropical cyclone that impacted North Queensland on 23:00 Wednesday 2 February 2011. 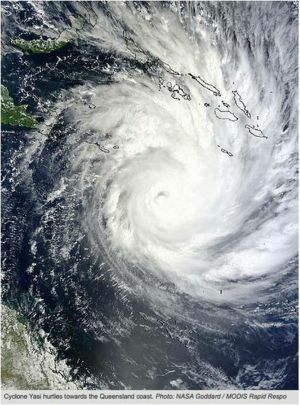 Professor Ross Garnaut stated that scientists have predicted there would be more frequent extreme cyclones - though not necessarily more frequent cyclones - due to greenhouse gas emissions. Prime Minister Julia Gillard announced that the costs for Cyclone Yasi would be met by budget costs rather than by increasing to proposed federal levy for the 2011 Australian floods. The total cost of repairing damage from the cyclone is likely to exceed AUD $ 5 billion. Maximum winds to 115 knots near the centre. Winds above 64 knots within 30 nautical miles in northern semi-circle and within 50 nautical miles in southern semi-circle with phenomenal seas. Winds above 34 knots within 190 nautical miles in northern semi-circle and within 280 nautical miles in southern semi-circle with rough to very rough seas and moderate to heavy swell. Over 50% of buildings in Innisfail and Cardwell are reported damaged. Mission Beach was also severely damaged. One person was killed, and two are reported missing as at 4 Feb 2011. The Hinchinbrook Marina was destroyed and around $40m of boats piled on top of each other and onto the shore. Sugar cane crops flattened and destroyed. The sugarcane industry losses are estimated to be up to $500 million. Banana plantations flattened and destroyed. Early estimates are that 75 per cent of Queensland's crop has been destroyed. Banana prices in Australia are expected to increase significantly as a result. Drinking water in affected towns is in short supply due to disruption of water pumping and treatment infrastructure. The cyclone travelled inland to Central Australia reducing in severity to a low pressure cell, bring heavy rainfall as far in as Alice Springs and as far south as Victoria. Houses above anticipated high storm surge water levels could be constructed with a concrete "safe room" in them to provide refuge from future cyclones. This page was last modified 23:32, 12 February 2011.